PGCC – Penang Global City Centre or Penang Greedy City Centre? PGCC is a super hot topic. Most definitely, changes are inevitable. Looks as if the Penang people are still not aware that a mega project is going to happen. Hearing that there will be another 37 tower blocks coming up in our lovely Penang Island in the next 20 years. I wonder can it take the weight, my tiny little island Penang? For few months now, talks, public local outcry can be heard. Wonders of amazement how such a mega structure project can get approval without the people’s knowledge. Questions were thrown to all authorities, NGOs working very hard thus the awareness of our beloved Penang island can be keep intact. As an insider, I ponder, listen to what my fellow Penangites have to say. I am not being partial to their opinions but after listening to what have been discussed I too felt these question they asked need to be answered. To the outsider who knows nothing about our rich heritage, most are excited that some great is happening. Penang need this but do we really? Penang Turf Club will be relocated to Batu Kawan, in the mainland 30 mins away from Penang. And then Penang Global City Centre mega structure will be built in the Penang Turf Club, 1930’s recreation plot of land. Many many questions were raised and not answered. 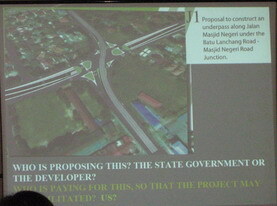 At least, listen and incorporate what the Penang locals feels they would like to maintain is what they are asking. 1. How did Open Recreational Space become Development land in the Structure Plan? 2. How did land granted by the State for recreation, at virtually no cost in the 1930’s now be the source of a RM25 billion project for a private developer? 3. Should the State not be given the first right of refusal if the Turf Club wishes to move? 4. How does the developer get a density of nearly 30 units to an acre when surrounding land in the Jesselton area is zoned for 6 units to an acre? 5. How can a project be launched by the PM when it has not yet been approved by the local authorities? 6. How can we Penang people be told that our traffic problems will be solved when we will be stuck in jams, for YEARS, while the flyovers and tunnel are being built at Scotland Road and Batu Gantong? 7. How can this project be launched BEFORE PORR is completed when their own traffic consultants have said that, only with the PORR, can the traffic dispersal system work. 8. Where is the detailed EIA required for a project of this gigantic size? And how did the preliminary EIA get approved so quickly? 9. Does Penang NEED a project like this when we currently already have more than 1,000,000 sq ft of empty commercial space? 10. Can’t low-rise residential homes & much needed green parks be an alternative? 11. Do Penang people WANT a colossal K.L. 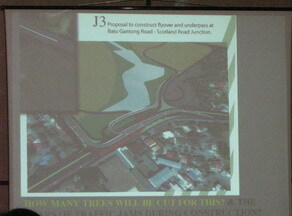 planned project like this which will change our island beyond anything that we know and love? Almost 20 years ago, Penang people said an emphatic NO to our hills being destroyed by massive re-development. We claimed our rights as the ordinary man-on-the-street, as citizens, as voters and most of all, as PENANGITES. Is this project actually being foisted on Penang by MONEY, by POWER and by CONNECTIONS? Already many of us lament what Penang has become with the traffic, the pollution and the over-development seemingly approved for the above reasons. To all of us who love Penang and who have contributed to her well-being, the PCGG is the ultimate assault on her very sanity and that of her citizens. SPEAK UP to voice your concerns. Well this is some of the lastest breaking news on what is happening on PGCC. Postcards and letters to the Chief Minister were handed out during the Sunday forum in Dewan Sri Pinang. So I will be off to take some photos of the Penang Turf Club before it is gone. Penang Turf Club is not going to gone. It will be relocated. Generally, if we compare the benefits of space we currently have as a turf club than a economic development, I think the later will be benefits the Penangites in the long run. Think about youngsters who will enjoy the fruits in the future. I grew up in Penang but not staying there any more … so tired that every time there is a development project there will be great opposition. Why can’t it be done without oppositon. I am so tired of it….. I moved out BUT I will definately visit PGCC when it is completed…. SO COOLlah. The opposition to this project actually comes from the minority. I’m a penangite too (from Gelugor to be precise),but currently residing in KL. When I went back to Penang for Raya last week, I did a quick, random survey on how the islanders (not talking about those in the mainland) viewed this PGCC. They’re mostly my relatives and friends who were born and bred in Penang, mostly in the mid 30s to 40s and with university education. I can say that 80-90% do not mind, if not supporting this project. Penangites like to complain a lot. You complain when even there is a need to cut a tree!! Of course you can’t get the best of everything. Certain things may need to be sacrificed for the betterment of the mass. Weigh that against the economic benefits, job creations etc of this project. KLCC was a good example. When it was builts some 10 years ago, everyone was sceptical. Do you know that now both towers are almost full, and they are working on the third tower, albeit a shorter one? 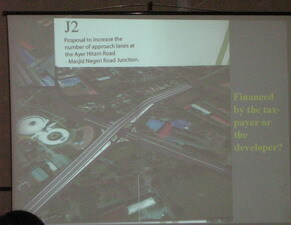 Perhaps the only thing that is of concern to me is transparency thru’out the project implementation. The masterplan is good,the concept is good. But why Equine? BTW, Today is 21st October 2007. Happy 191st birthday to my alma mater, the great Penang Free School. Even as a local way back in the 80’s, we were not able to purchase a house in Penang. Landed property for a three room was costing RM1 mil, in locations I love. Per square feet then it was RM 30 to 40. There was no way, a simple family of both working parents with 2 kids could afford to buy. We were kicked out of Penang, why. We simply couldn’t afford to buy landed property as we were not interested in living in apartments or condominiums. So we have to find places where greenery and people who are still warm and friendly in mainland Butterworth. I still wish I could afford a property in Penang. PGCC bought the Penang Turf Club at RM45 per sq feet in 2002. 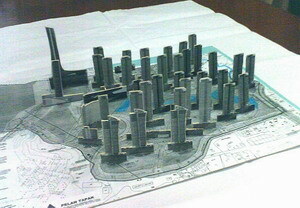 Now in 2007, it is worth RM250 per sq feet and plans to start construction is just underway! So how much will it sell to the locals? It is targetted for foreigners to make Penang their second home. We talked to some foreigners and the common reply is that most of them are buying the old colonial houses or the Straits Electic houses left by some of the locals. The locals who couldn’t afford to renovate their heritage houses. The Brits and Aussie are mostly staying in our Penang roads and rebuilding these houses which are heartening. Some locals too are not selling their heritage “Kong Chu” so kids can come home. Again my concern is back to Komtar. Komtar was supposedly over 65 stories. Today in 2007, it should be full occupancy,dont you think? But the real story is, only 30 percent is occupied and most are leaving for better and most modern facilitated building all over Penang towns. Even the government offices are moving off, one by one to their own building. 30 years from now, I hope my grandkids can enjoy from this nature, Penang is fighting to preserve. I dont hope to know my grandkids have to go to home stay or animals farms just to know what a cow, a chicken, bullock cart, a “nona” (apple custard) or durian look like? And yes development has to go on, just take a drive to Balik Pulau and you know locals are building houses to stay there. The roads are beautifully constructed amidst the greenery. So in conclusions, locals moves out or go further out of Penang and Penang will another HAWAII but a concrete one. How about that? I am glad where i stayed now, I wake up to smells of morning dews, the cuckooing of the roosters at the “right timing”, not one that has gone crazy, just cuckooing at any hour. And when it rains, I see rain waters dripping off the leaves or roofs, it is so serene, soothing and relaxing. Life is good. Fortunately some grandaunts houses still rears ducks, so still have a chance to cut and clean fishes and feed the ducks. Yea “li, li, li” as I called to the ducks. never like what we call as urban living. 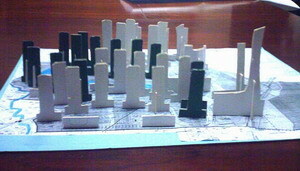 But time has passed, we who currently live in the city, enjoy the benefits of urbanization. We choose to live in apartments, we worked hard so that after sometimes we can buy landed property. Its the way of today’s living. The more development in the city the more people indirectly have the opportunity to increase their standard of living. My friends and I, we graduated from local university choose not to work or stay at our hometown. Why? Because of slow development and limited opportunity. We don’t want to waste our 4 years of studies. We need to join the rat race in KL and challenge ourselves. Otherwise, we will be left out. But if there is any development and modernisation, lots of foreigners come and invest we will be glad to serve for our own state. We hope with projects like the PGCC, we can come back home to Penang. Have you ever stopped to think that people from kl might resent people from elsewhere coming to kl to work. Imagine if they were selfish like some people in Penang. Where would we be today if each state not wanting development. What a great advance for penang island……!!!!!!! Haha! I think only old Penangites running mad over this matter. I don’t understand why the NGO’s claimed themselves as the voice of Penangites. As far as I know all my family, friends and me can’t wait to see the advance development of Penang especially the PGCC. I hope the developer or investor will ignore those NGOs crap. They always like to complain and will never stop. Take KLCC for example. Once they are several old timer object the KLCC project. Now see lah, we the young people enjoy the fruits. We are reaching a stage where if we don’t do something drastic very quickly then it will be too late. To all those people reading this blog, please help spread awareness of the true story!